Welcome to Day #2 of Chocolate and Coffee Theme Week. Today's chocolate and coffee flavored item was a yogurt. 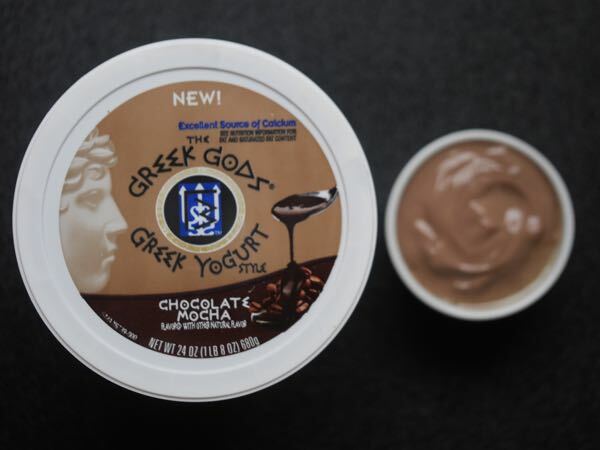 The Greek Gods Chocolate Mocha Greek Style Yogurt was Manufactured for and Distributed by The Hain Celestial Group, Inc. (Lake Success, NY). It's not always easy to blend chocolate and yogurt. The slightly acidic tangy flavor of yogurt can clash with chocolate. Today's Chocolate Mocha yogurt was successful in making this mix work. The yogurt was smooth and creamy and the mocha blend was flavorful without being too sweet. While it did contain vegetable gums, the ingredients list was relatively straight-forward, mercifully short and "natural," with no starches or artificial colors or flavors added.